Just an update on the dinosaur book. Bet you wondered what was going on. Well, it's been a slog to get it done, an art director was canned because of various reasons, and oddly it seems to be going ALOT faster and smoother with this person's departure! Lots of coordinating and logistics to do on it. However, above are some of the results of what we've done. You'll remember the T-Rex from some months ago on it's own. 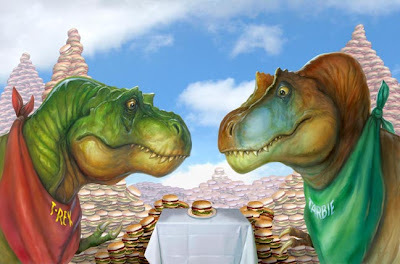 Here it is (top) composited via Photoshop and painted over via Corel painter with a zillion hamburgers. Keep in mind the book is made for 4-8 year olds so some artistic license was involved. Next to the T-Rex is the relative Tarbosaurus, a smaller but equally toothy Tyrannosaur relation. The bottom pic is what happens when kids go hang gliding with a Pteranodon! 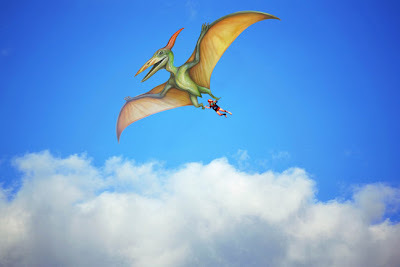 Originally, there was a hang-glider there and Cortney Skinner simply took it out and, composited in my Pteranodon and adjusted lighting and so on. We're all pretty happy with what we're seeing. This is what's been taking alot of my time of late instead of smaller paintings. Fear not, I'll still be doing them but in these days, business calls and all things considered, busy is good. Looks like a fun book for the kids. When will it be out, my 3 year old will flip. Certainly will look forward to it, was hoping it would be ready so you could have some copies at Illuxcon. Way too cool. Can't wait to see it in print! Very cool, Bob. Glad to hear that things are proceeding more smoothly now! Julie-thanks! I'll be sure to tell everyone when it's out.